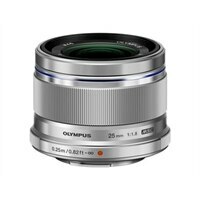 Olympus M.Zuiko Digital Lens 25 mm f/1.8 PREMIUM Micro Four ThirdsThe M.Zuiko Digital 25mm F1.8 standard high-image quality lens features a bright aperture value of F1.8, and focal length of 50mm (35mm equivalent) in a compact, lightweight form. Because this lens provides an angle of view that is close to a natural field of view just as is seen by the naked eye, this is the perfect everyday lens for snapshots, portraits, and landscapes. The large F1.8 aperture of this lens will offer beautiful defocusing effects, and reducing subject blur in dark indoor shots for more enjoyable shooting, making this the perfect first interchangeable lens. The M.Zuiko Digital 25mm F1.8 is a high-quality, standard lens that produces beautiful defocusing effects and high resolution, along with the same high optical performance of the popular M.Zuiko Digital 45mm F1.8, while maintaining a compact and lightweight size. Traditional 50mm DSLR standard lenses generally use a Gauss-type configuration, however, to achieve a smaller form, fast and quiet AF, lens design for the digital age with an inner focusing system was used. To reduce aberration from the center to the periphery, 9 lenses including an aspherical lens are lavishly used, demonstrating clear and sharp optical performance. Also, by using the Olympus-original ZERO (Zuiko Extra-low Reflection Optical) coating, ghosts and flaring are suppressed for clear depictive performance even in backlit and other unfavorable shooting conditions. The M.Zuiko Digital 25mm F1.8 can shoot up to 25 cm away for close-up photography, with a maximum magnification factor of 0.24x at 35mm equivalent (0.12x), able to fit a postcard sized shot (A6 equivalent) in the screen full size. When shooting close-ups of tableware or food, the aperture setting of F1.8 creates soft defocusing effects for tabletop photos that are a touch different than the average. By combining this lens with the separately-sold Macro Conversion Lens MCON-P02, close-up shooting up to 17m away is possible, for easy macro photography at a maximum shooting magnification of 0.436x at 35mm equivalent (0.218x). The M.ZUIKO Digital 25mm F1.8 is equipped with the MSC (Movie & Still Compatible) mechanism inner focusing system for fast, smooth, silent, and high-precision AF (auto focusing). When used in combination with fast AF on Olympus Pen and OM-D series cameras, you'll never miss a shot. The M.Zuiko Digital 25mm F1.8 standard high-image quality lens features a bright aperture value of F1.8, and focal length of 50mm (35mm equivalent) in a compact, lightweight form. Because this lens provides an angle of view that is close to a natural field of view just as is seen by the naked eye, this is the perfect everyday lens for snapshots, portraits, and landscapes. The large F1.8 aperture of this lens will offer beautiful defocusing effects, and reducing subject blur in dark indoor shots for more enjoyable shooting, making this the perfect first interchangeable lens.